Graphite is a soft crystalline form of carbon (atomic number 6) and its symbol is C; other forms are diamond and fullerenes ("buckyballs"). It is gray to black, opaque, has a metallic luster, and has a black streak. (Streak is the color of a mineral when it is crushed to a powder). It is an extremely soft mineral at 1 to 2 on Moh's hardness scale. Its softness and streak make graphite useful in making "lead" for pencils. It is flexible, but not elastic. Crystals are uncommon, but when they occur, they are found as rough, six-sided (hexagonal) flakes. It breaks into minute, flexible flakes that easily slide over one another. Mineralogists call this basal cleavage. This feature is the cause of graphite's distinctive greasy feel. It is this greasy characteristic that makes graphite a good lubricant. Because it is a solid material, it is known as a dry lubricant. Graphite occurs naturally in metamorphic rocks, such as gneiss, marble, and schist. It considered a semimetal because it exhibits the properties of a metal and a nonmetal, which make it suitable for many industrial applications. The metallic properties include thermal and electrical conductivity. The nonmetallic properties include chemical inertness, lubricity, and high thermal resistance. Graphite is mainly used in brake linings and in refractories, which are heat-resistant materials; an example of refracories is the brick lining of furnaces and kilns. Graphite is not mined in the United States. Most of the natural graphite used in the United States comes from Canada; China, which is the world's largest producer; and Mexico. Synthetic graphite, which is made in the United States and other countries, is increasingly used in place of natural graphite. Graphite was named from the Greek verb graphein meaning to write because it was once used in the manufacture of pencils. The name was given by Abraham Gottlob Werner in 1789. Its "Old World" (that is, old European) name was plumbago which means black lead, a reference to its use in pencils. It is estimated that the world reserves of graphite exceed 800 million tons. China is the most significant graphite-producing nation, providing nearly one-half of the United States' annual graphite demand. Flake graphite is also imported to the United States from Brazil, Canada, and Madagascar. Lump graphite is imported from Sri Lanka. Graphite resources in the United States are very small. At one time a significant deposit at Ticonderoga, New York, was exploited, but this source no longer produces graphite. For a number of years, the United States has not produced natural mineral graphite and is completely dependent on the combination of imported, synthetic graphite, and recycled graphite sources. Because graphite flakes slip over one another, giving it its greasy feel, graphite has long been used as a lubricant in applications where “wet” lubricants, such as oil, can not be used. Technological changes are reducing the need for this application. Natural graphite is used mostly in what are called refractory applications. Refractory applications are those that involve extremely high heat and therefore demand materials that will not melt or disintegrate under such extreme conditions. One example of this use is in the crucibles used in the steel industry. Such refractory applications account for the majority of the usage of graphite. It is also used to make brake linings, lubricants, and molds in foundries. A variety of other industrial uses account for the remaining graphite consumed each year. Molybdenum disulfide is a good dry lubricant substitute for graphite. 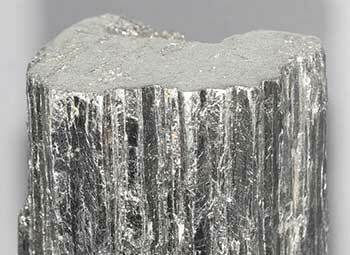 However, unlike graphite, molybdenum disulfide is not as stable in oxidizing conditions. Manufactured graphite powder can be used in the steel industry. However, as long as graphite deposits remain abundant, and the cost of raw graphite remains low, producing large quantities of manufactured graphite will be unnecessary for many years to come.